9-11 is used so often by people that I do not agree with politically as a justification for hate and war. Often, the people who talk about 9-11 the most are not New Yorkers and really have no idea what it was like for us. I was working downtown, just a few blocks from the towers. I was lucky to be at home when the towers were hit, but in the aftermath I saw my beloved city overrun with soldiers with weapons and tanks. I had to wear a mask for a while to walk the streets. The city was so sad. Everywhere you looked, people were in mourning — for those lost, but also for ourselves. Then they shot the lights into the sky. They were two shining beacons of optimism. 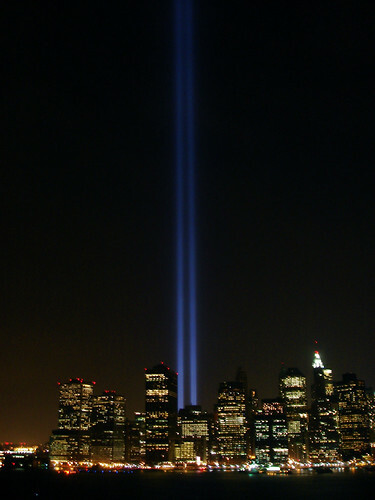 We were going to be ok. No memorial or “freedom tower” will ever top the simple power of two lights shining up into the sky.